The first mask is used to compute Gx while the second is used to compute Gy. The gradient magnitude image is generated by combining Gx and Gy using Eq. (5). Figure 7B shows an edge magnitude image obtained with the 3x 3 Sobel operator applied to the magnetic resonance angiography (MRA) image of Fig. 7A. The results of edge detection depend on the gradient mask. Some of the other edge operators are Roberts, Prewitt, Robinson, Kirsch, and Frei-Chen [36,41,53,96,97]. FIGURE 7 Edge detection using Sobel operator. 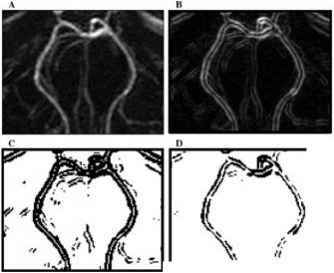 (A) Original angiography image showing blood vessels, (B) edge magnitude image obtained with a 3 x 3 Sobel mask, (C) edge image thresholded with a low threshold (300), (D) edge image thresholded with a high threshold (600). Gx2 + Gy and the direction of the gradient as D ^ tan-(g where Gx and Gy are gradients in directions x and y, respectively. Since the discrete nature of digital image does not allow the direct application of continuous differentiation, calculation of the gradient is done by differencing . results of thresholding at two different levels. Please note that the selection of the appropriate threshold is a difficult task. Edges displayed in Fig. 7C include some background pixels around the major blood vessels, while edges in Fig. 7D do not enclose blood vessels completely. The edge-based techniques are computationally fast and do not require a priori information about image content. The common problem of edge-based segmentation is that often the edges do not enclose the object completely. To form closed boundaries surrounding regions, a postprocessing step of linking or grouping edges that correspond to a single boundary is required. The simplest approach to edge linking involves examining pixels in a small neighborhood of the edge pixel (3x3, 5x5, etc.) and linking pixels with similar edge magnitude and/or edge direction. In general, edge linking is computationally expensive and not very reliable. One solution is to make the edge linking semiautomatic and allow a user to draw the edge when the automatic tracing becomes ambiguous. For example, Wang et al. developed a hybrid algorithm (for MR cardiac cineangiography) in which a human operator interacts with the edge tracing operation by using anatomic knowledge to correct errors . 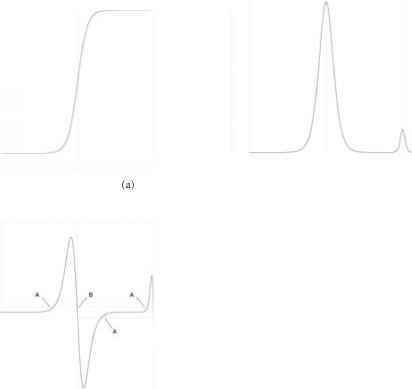 A technique of graph searching for border detection has been used in many medical applications [6,14,64,81,105,106,112]. In this technique each image pixel corresponds to a graph node and each path in a graph corresponds to a possible edge in an image. Each node has a cost associated with it, which is usually calculated using the local edge magnitude, edge direction, and a priori knowledge about the boundary shape or location. The cost of a path through the graph is the sum of costs of all nodes that are included in the path. By finding the optimal low-cost path in the graph, the optimal border can be defined. The graph searching technique is very powerful, but it strongly depends on an application-specific cost function. A review of graph searching algorithms and cost function selection can be found inRef. . Since the peaks in the first-order derivative correspond to zeros in the second-order derivative, the Laplacian operator (which approximates second-order derivative) can also be used to detect edges [16,36,96]. FIGURE 8 Results of Laplacian and Laplacian of Gaussian (LoG) applied to the original image shown in Fig. 7A. (A) 3 x 3 Laplacian image, (B) result of a 7 x 7 Gaussian smoothing followed by a 7 x 7 Laplacian, (C) zero-crossings of the Laplacian image A, (D) zero-crossings of the LoG image B.